The original Digimon Adventure is a series that I cannot view without the framework of nostalgia. 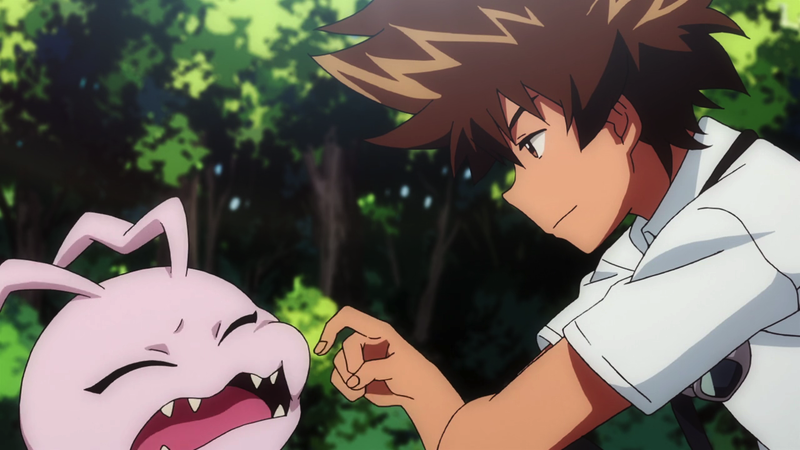 I grew up watching it and because of this, was excited to check out Digimon Tri. My excitement and anticipation has dwindled with each movie, but nonetheless, it’s still been fun — awkward at times, but always fun — to load up the latest movie installment and reunite with my favorite characters. When I was in high school, I was in musical theatre. The ramp up to a show is always a mess, but it’s an exciting flurry of action. The actual performance goes by in a blur, until afterwards, you’re breaking down sets in sweats, staring at an empty stage that seems all the emptier because it’s over. The moment has passed. Returning to that stage won’t bring back the show. If anything, the stage without the show is a bit painful to look at because it was never the location, or even the people, but the time spent working towards a common goal. Digimon Tri acknowledges a similar feeling of loss and separation through the eight chosen children (digidestined) reunited for another fight. It’s not the same. The nature of their relationships with each other — not romantic feelings but even friendships and familial bonds — have naturally changed over time. All of their fights in the first season, never mind the second season which has been treated horribly by Tri, are firmly in the past. To Tri‘s credit, their reunion is often awkward. Tri sometimes feels like peering in on the chosen children’s lives without permission. As fans, we have our own ideas of what we want to happen because we were part of the initial experience. While they’ve grown up offscreen, we’ve aged significantly more in the interim. Unfortunately, the latest Digimon Tri movie, Loss, is a bit of a mess. Not barely-controlled chaos like the ramp-up time before a performance, or the awkward feeling of returning to a childhood favorite only to find that everything and everyone has changed — but an actual mess. Loss eschews beginning where the third movie, Confession, ended for an silent movie that shows the original chosen children — prior to the eight in Digimon Adventure. This is the first of many odd visual choices throughout the movie that weren’t as prevalent in previous installments. The silent film is informative but drags a bit too long and feels disconnected from the rest of the action. Later, Loss builds on this, showing Maki Himekawa’s distress at the sacrifice of her partner digimon, Tapirmon, as the reasoning behind the Digital World reboot. When Himekawa finally is able to reunite with Tapirmon, her digimon partner doesn’t remember her, much like none of the eight digimon partners remember their human counterparts. Again, returning to the same place where they first entered the digimon world, and reuniting with their partners for a third time now, Tri reiterates that things change. Himekawa’s desire to be with Tapirmon again doesn’t play out the way she wanted it to, another reminder that we cannot return to the past, even if we return to the same location or setting. 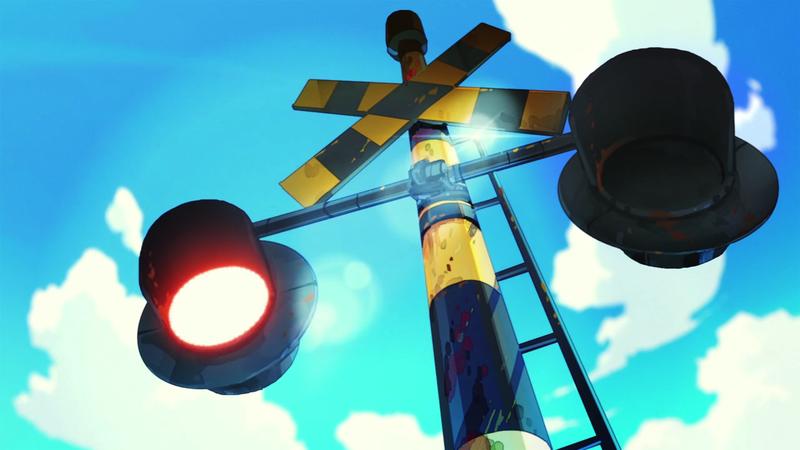 The digidestined’s return to the Digital World is steeped in familiar imagery. 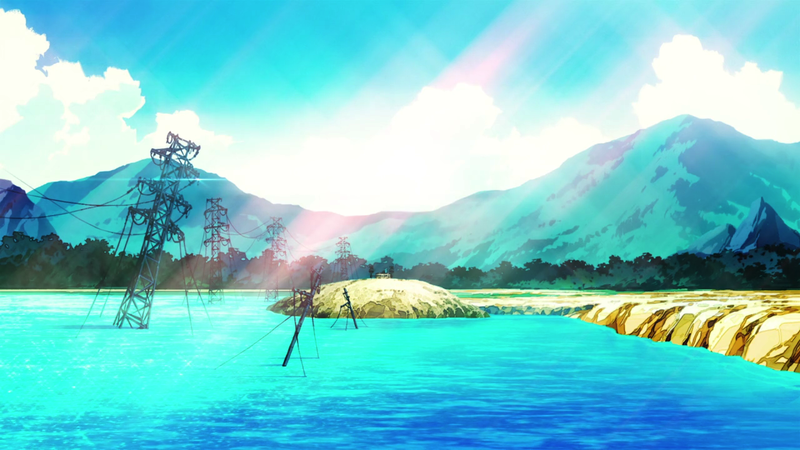 There’s the beach, the wayward power lines, the railroad crossing. 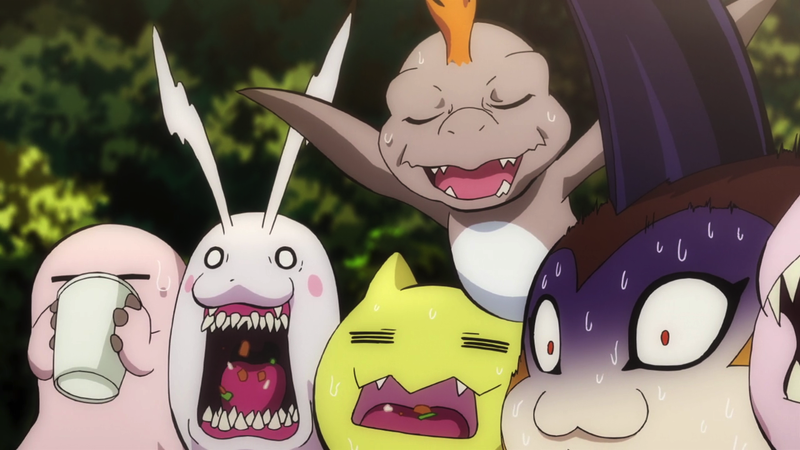 It’s meant to bring the viewer back to their first arrival to the Digital World, and their first experience with Digimon as a whole. The only thing missing is the line of public phone booths with nonesense messages. Loss is meant to run parallel to the first narrative arc of Digimon Adventure. The digidestined arrive, they meet their partners, they get separated and have to go through their own challenges with their new digimon allies. This time around, the humans have retained their memories but their partners have not, further underlining the point that returning to a place once visited in the past doesn’t mean that you can return to the past itself. Although it felt forced at times, Sora Takenouchi’s rocky reunion with Biyomon was successful because it too reiterates this theme. 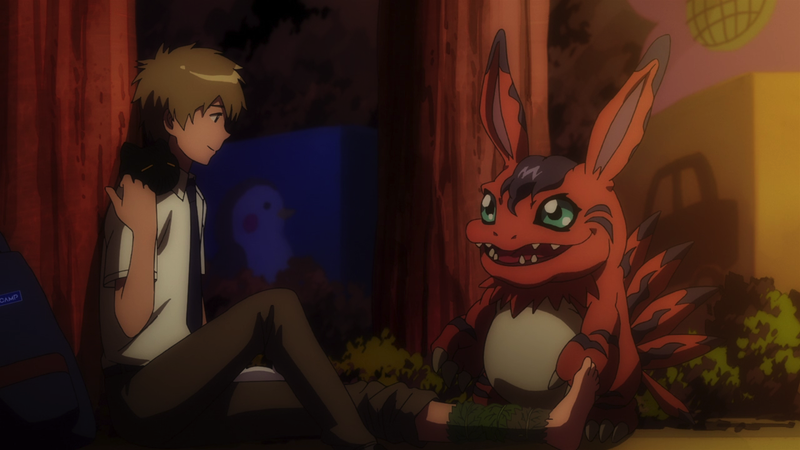 Sora comes to the Digital World assuming that she and Biyomon will immediately pick up where they left off — like Himekawa does with Tapirmon following the reboot. In both cases, the partner digimon is distrustful at this sudden intrusion without any memory of their preexisting bond. That being said, Loss doesn’t take advantage of the scope that a movie brings. What could have been a poignant return to the Digital World is broken up by a silent movie introduction and random exposition from Daigo Nishijima, Hackmon, and Gennai — the latter of which does his best Oberon (Sword Art Online) impression. At times, it feels like two different stories mashed together awkwardly. What made Digimon Adventure so interesting was the character relationships between the digidestined and their digimon partners. When Loss moves away from this, it falters. Even now, I can’t tell how much my expectations as a fan of the original series affect my outlook on Digimon Tri. Yet, I loved the feelings of distance emanating from the chosen children in the first two films. Reuniting doesn’t mean picking up where things left off, and I appreciated that Tri acknowledged this. While Loss attempts to continue this sentiment, it fails to execute it at times. Although I admittedly watch for nostalgia purposes, the series can’t run on nostalgia alone. Tri is at its best when it focuses on how the past must be left behind, as painful as that may be. It’s its worst when it becomes a vehicle for hollow references and flimsy excuses to stick characters in familiar situations.